Forbes published their annual America's Best Employers For Diversity to identify companies making progress to welcome and support all workers. Synchrony Financial ranked #2 employer in CT for Diversity. 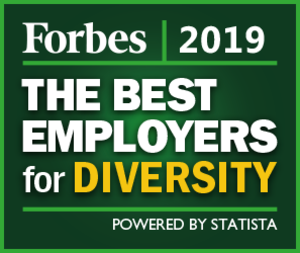 Forbes partnered with market research company Statista to create the annual ranking of America’s best employers for diversity. The list was compiled by surveying 50,000 Americans working for businesses with at least 1,000 employees, and it features some businesses whose appearance on the list, in light of recent events, may come as a surprise. Synchrony Financial was ranked #80 on the list which is the best of any Fairfield County company. To determine the list, Statista surveyed 50,000 Americans working for businesses with at least 1,000 employees. All the surveys were anonymous, allowing participants to openly share their opinions. Respondents were first asked to rate their organizations on criteria such as age, gender, ethnicity, disability and sexual orientation equality, as well as that of general diversity. These responses were reviewed for potential diversity gaps. So if workers from minority groups, for example, rated an organization poorly on diversity, but nonminority groups rated it highly, Statista would take that into account and adjust the company’s score accordingly. Statista then asked respondents belonging to minority groups to nominate organizations other than their own.